In the Western world Christmas morning brings the joy of openings your stockings in front of the fire and stuffing your face with turkey and sprouts. How about bringing some eastern European customs into your festivities, and serving sweet baked portica instead of mince pies, decorating the table with watermelon, or forgetting about your family altogether and feeding some bears instead? Festive traditions in the new east come in all shapes and sizes, whether that means going carolling, preparing festive dishes like grey peas or dressing up in a bear suit to scare away evil forces. A large part of Eastern Europe celebrates the Orthodox Christian Christmas which falls on January 7 rather than December 25, but either way, almost every country has its unique customs. Across many of the nations formerly under Soviet rule, traditions tend to be very similar. New Year's Eve was introduced after the revolution as the new holiday to replace Christmas, in an attempt to erase religious traditions. With the collapse of the USSR many people went back to celebrating Christmas, reviving the old traditions and adding them to the ones that were created in the Soviet period. Read on for some of the most popular and suprising customs among them. Badnjak is the Serbian celebration of the Yule log. Traditionally the father of the family, accompanied by his sons, travels to the forest early in the morning to ceremoniously cut a log from a young and straight oak. The log is then brought to the house, set on fire, and is supposed to burn throughout Christmas Day as the family's visitors strike it with branches to make it spark, wishing their happiness be as plentiful as the sparks. The tradition is still ablaze in smaller towns and villages but in bigger cities the badnjak is often represented symbolically by oak twigs that are used to decorate the house at Christmas. Potica is a sweet bread — a swirl of nuts, cinnamon, honey and spices — prepared in Slovenia for Christmas. Traditionally there are around 60 types of potica and several ways to roll it into shape: the dough, already filled with nuts and spices, is either formed into a circle in a round pan, or baked in the shape of a log. Today over 120 recipes for potica are available, including vegan and gluten-free versions. 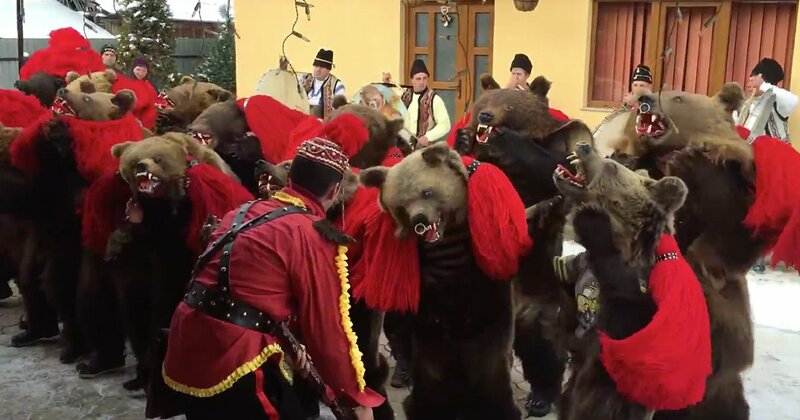 The pictures of this Romanian Christmas tradition usually go viral in December each year: the sight of children and adults carolling dressed as bears, either in real skins or ones made out of faux fur. The origins of the tradition can be traced back to pre-Christian times when the bear was considered sacred. Performers in bear costumes sang songs to ward off evil for the coming year, and families would give them treats and money for doing so. Now the custom is usually spread out between Christmas and New Year's Eve, and seeing people dressed as bears on the metro and city buses is an everyday affair for many Romanians. Placindi are traditional Moldovan flat pies that usually come with fillings like cottage cheese and pumpkin. But for New Year celebrations, little pieces of paper with good luck wishes or predictions of good fortune are baked into the dough, like fortune cookies. The pies can be individual and bite-sized, but sometimes the wish can also be found in a larger flatbread, which heats up the competition to get the lucky piece of placindi. A unique Christmas bear festival takes place in the town of Český Krumlov, where bears have been kept in the moat of a castle for centuries. Christmas trees are placed around the castle while the moat is decorated with treats and fruit, and guests get to place edible gifts (usually inspected by the bear keepers first) into it. The crowd usually gathers on the castle bridge to watch as the bears, who are usually fed a healthy diet, enter the moat and devour every bit of food left for them, much like people at Christmas dinners around the world. One of Latvia's traditional Christmas dishes is pea stew with smoked bacon. Grey peas are usually soaked overnight, boiled and then stewed with butter, onions and bacon. The dish might not appear very appetising, but the taste is a national favourite. A tradition for Christmas and New Year dictates that all the peas should be eaten on the day so that “old tears aren’t left over for the next year”. Chichilaki in Georgia are what Chritsmas trees are to Europeans — a must. Traditionally they were carved from dried up branches that were shaved into ribbons to look like a tree for the orthodox Christian Christmas on January 7. The custom says that the shaved tree resembles the beard of St. Basil the Great, a Georgian Santa who sports facial hair to rival Santa's. Now chichilaki can also be bought in stores, and many people choose to decorate them with fruit (a symbol of prosperity) and European-style Christmas decorations. The chichilakis are also burned in a ritual after the holidays, on the day before the Georgian Orthodox Epiphany on January 19, to symbolize the passing of the previous year’s troubles. Christmas table-setting traditions are special in Poland, and are still followed by many families today. An extra plate is usually set on the table, traditionally at the best spot in case an unexpected guest shows up, who then has to be treated with utmost respect. For luck, it is thought that the number of dishes served has to be odd, and the number of the people at the table even. The table is also often decorated with straw as a symbol of Christmas. Watching Soviet films is probably one of the most recognised New Year's Eve traditions in Russia. The festive classic Irony of Fate, or Enjoy Your Banya! is a 1976 film by Eldar Ryazanov that is sometimes watched several times: first during dinner preparations when people are making the famous olivie salads and then again in the long New Year holidays in January when lazily eating the leftovers. The film in its essence is a tale of miracles and love and takes place in typical Soviet apartment blocks with typical Soviet characters and issues. Other films often watched are Magicians, a 1982 musical by Konstantin Bromberg that deals with New Year magic, Carnaval Night (1956), another Ryazanov classic, and the cartoon Twelve Months (1956). Serving lots of fruit on the table on New Year's Eve is a must in Armenia and Central Asia as it symbolises prosperity for the year to come. 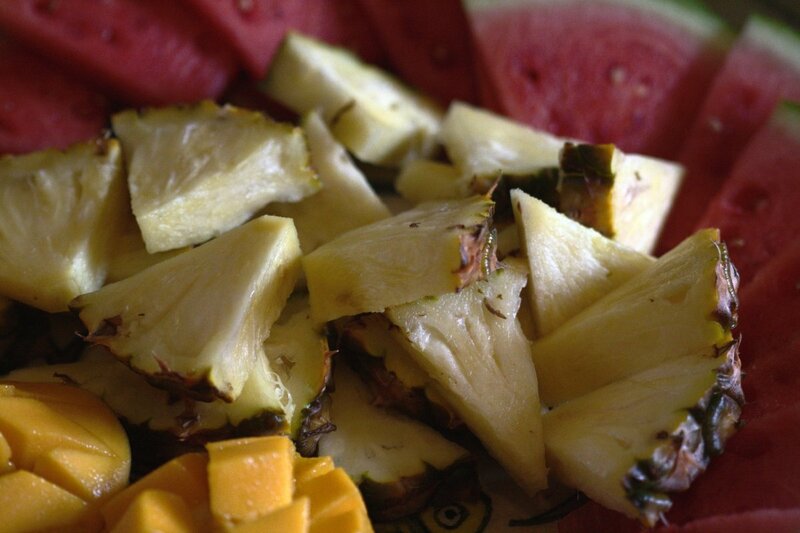 Often a watermelon is a staple: the ripeness of the fruit determines whether the next year will be a lucky one for the family. Making New Year's resolutions isn't traditional in most post-Soviet countries, but making wishes for the year to come is, and some people honour the ritual of eating 12 grapes as the clock strikes 12 times on midnight, making one wish with every grape. Generous Eve (Schedriy Vecher) is a folk holiday that is celebrated on the day of the Old New Year on January 13 according to the old Orthodox Christian calendar. Traditionally the day started a whole week of celebrations to welcome the New Year, although now often only Generous Eve is celebrated. The rituals resemble those of a Christmas Eve: there is carolling with a custom of giving treats like pies or blini to the carollers, a festive dinner and traditional games for family and friends are organised, as well as divinations, many of which are supposed to reveal the identity of future husbands to unmarried girls. The rite of the Kalyady Tsars, or simply Christmas Tsars, is a UNESCO-protected tradition in a small Belarusian village in the Minsk region. Some experts consider it a part of Generous Eve, as it is also celebrated on the Orthodox Christian New Year's Eve. The tradition dates back to the 17th century and takes the form of a play where young men dress as “the Tsars” in white embroidered shirts, tall hats and ribbons, and visit the houses of young and unmarried girls to perform little comical plays for treats. Traditionally 500 men were supposed to play the parts of the Christmas Tsars, but as the village's population began to decline, people from the rest of the country started to travel there to participate.